I am interested in duration as it applies to the concept and presence of community. I use photography as an inherent abstraction of the temporal experience. 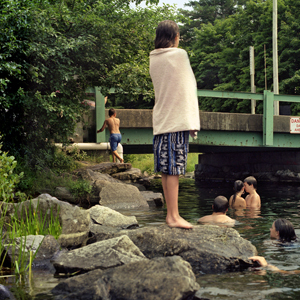 My current work looks at swimming holes as a form of community at its most basic level. At these selected, secluded swimming spots patrons toss aside their social skins, strip down to a sociably acceptable level and dive in to the communal waters satisfying a need to free up pretenses and relax for the common good. Watering holes fulfill as similar function in nature where predator and prey momentarily set aside their places in the natural order to satiate a basic need of water for survival. The work is also about permission, trespass and ownership as it relates to the land and water. Swimming holes are disappearing from the communal landscape. Waterfront property garners premium pricing. The potential liabilities associated with water-based activities do not encourage private or public landowners to open up their shore front to recreational use. Also natural phenomena, such as floods and landslides can render former deep stretches of water into a swamp. In my work I envision each image is a narrative that reflects an experiential event. To that end, my images vary from single frames depicting a fraction of a second to composites that are composed and exposed over a course of time that ranges from several minutes to several hours. In combining the images I gain a more thorough reflection of the duration experience.